Cisco VPN Client 5.0.07.0410: Error 1720. There is a problem with this Windows Installer package. The above comes up when trying to install Cisco VPN Client 5.0.07.0410 on Windows XP SP3 (so far). 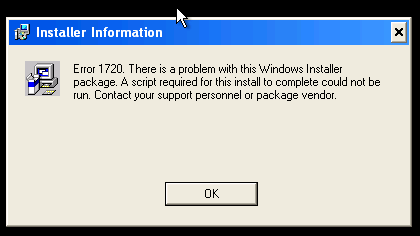 I didn’t have this issue on Windows 7 SP1. This entry was posted in Cisco, Support and tagged 5.0.07.0410, cisco, error 1720, vpn client, vpnclient_setup.msi on October 16, 2012 by Adrian Kielbowicz.